Food waste isn’t just a devastating misuse of natural resources, it’s also a huge part of the world’s carbon footprint, according to the United Nations Food and Agriculture Organization (FAO). Every year, the world throws out about 1.3 billion tons of food – a startling one-third of the food produced. And that creates a greenhouse gas footprint bigger than all countries, except fo China and the U.S.
That means 30 percent oft he world’s farmland – about 3.5 billion acres – is wasted. The majority of food waste (54 percent) happens during and after food harvesting, particularly while it’s handled and stored. The rest occurs during the processing, distribution and consumption stages. In developed economies, such as the U.S., where up to 40 percent of all food is wasted, the issue is one of consumers buying too much and throwing away what they don’t need. Elsewhere, in emerging and developing nations, the waste comes from framing inefficiences and a lack of proper storage, reports FAO. Asia (China, Japan, Korea) is a regional hot spot for vegetable waste and rice, the cultivation of which is extremely carbon-intensive. Meat waste is a big issue in Latin America, which accounts for 80 percent of the world’s meat waste. 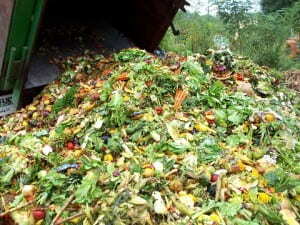 Fruit and vegetable waste is problematic in Asia, Latin America and Europe. The highest priority is to reduce crop losses through better farming practices, says FAO. Also important are re-use and recycling strategies that make it easier to donate surplus food to those that need it, and to divert foods no fit for human consumption to livestock.